It’s easiest to think of legislation as either controversial or non-controversial (obviously some bills are in-between). An example of non-controversial legislation would be a bill that is budgeting money to fix a broken part of the Washington Monument. Generally, nobody is going to make a big fuss about something like that. 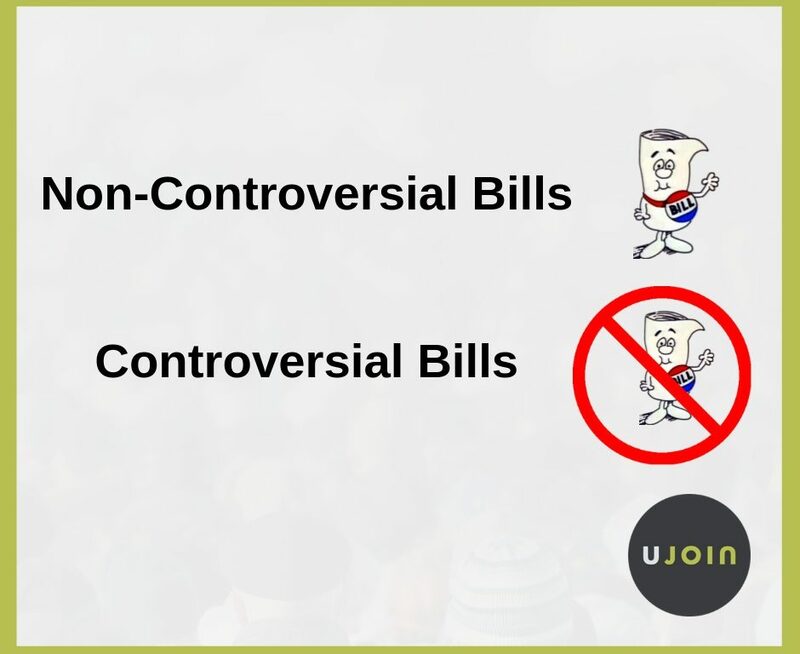 Most non-controversial legislation will peacefully make its way through the committees, just like it’s described in the School House Rock version of “I’m Just a Bill”. Controversial legislation plays by different rules than the ones talked about in school or the School House Rock video. It plays by different rules because there are a variety of factors that make it high stakes and an ideological battle ensues. Faction — this is a “voting block” — a informal group of more than two legislators who who meet unofficially and who agree to vote the same way — together — on controversial legislation. Usually, there are one or two unofficial spokespersons or leaders of a faction, depending upon its size. 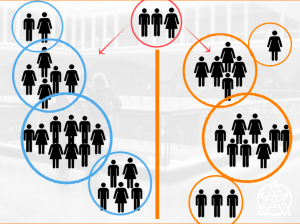 Factions generally follow party lines, but there are multiple factions within parties and they debate fiercely amongst themselves and with factions of other parties. 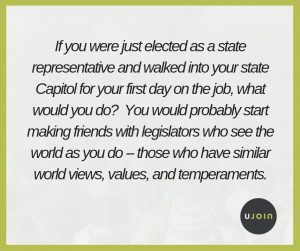 If you were just elected as a state representative and walked into your state Capitol for your first day on the job, what would you do? You would probably start making friends with legislators who see the world as you do — those who have similar world views, values, and temperaments. This is basically how factions get formed — they are informal voting blocks of legislators who have similar views and agendas. 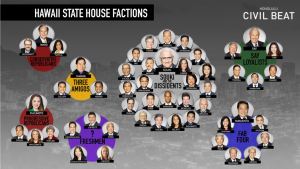 In 2016, online news outlet Civil Beat did some excellent reporting on how the Hawaii State House factions were divided up. Because none of these factions are official, there’s a good chance that Civil Beat got some of this info wrong, and that these factions changed shortly after the article was published. Still, this is a great depiction of how voting blocks emerge. Let’s say there’s a voting block or faction of 20 Representatives. They might find an outlying faction of five Reps and court them to join their voting block. The group of five might informally say “we’ll join your voting block as long as you support bills x, y, and z.” Generally speaking, the biggest faction has the most power and influence when it comes to voting for House Speaker and Senate Leader, which means they have the most power in general. Factions are continually changing and being renegotiated. Because voting blocks are not official, they do not need to document meetings or agreements. They continually morph and change based upon many internal and external factors. This shouldn’t be a huge surprise, and it shouldn’t be greeted with sneers and cynicism — this is just the way humans operate. We have values and goals, and we make trades and compromises to achieve those goals — that’s it. Factions will informally negotiate (horse trading if you will) on different controversial bills. For example, faction A might say to faction B: “We’ll vote for this omnibus spending bill, if you do not support parts x, y, and z of the tax bill”. These informal negotiations take place behind the scenes, informally, so often times when it comes to the committee votes (the stuff you see on C-Span), the deals have been made and legislators know how they’re going to vote. That’s why controversial bills don’t work the way we’re taught in school: we’re not taught about factions and informal vote-trading.